HollyWouldStudio: Now Doing Birth Announcement Cards! Now Doing Birth Announcement Cards! 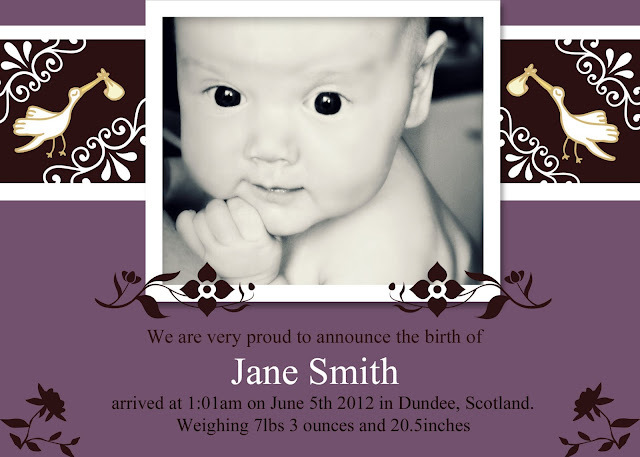 So happy to announce that Raving Mad About Photography now does birth announcement cards. Above are two examples of the birth announcement cards you can now get via RMA Photography either with a Newborn Session or send me a photo that you would like to use and I will design your own personal announcement card or you can select one of the new templates coming soon! These are a great, simple ways of letting everyone know the details of your newest little one's birth details so they have a reminder for each birth day to come. Even better, if you decide to schedule a newborn shoot you can choose a photo from the shoot to add to a birth announcement card! What a great way to share the news?